This gym-oriented program has been formulated to mould you into a soccer beast. The overall objective is to use functional exercises based on athletic movements to get you a powerful core, strong legs, and ripped muscles (without the bulk). These exercises are used in a specific periodization to increase your gains in less time. I have collaborated with a high-level Personal Trainer, my brother Dakin Drake, to reinforce this program with extra professional knowledge and professional soccer experience. The program can be used in offseason, or modified to be used throughout your season (depending on your frequency of team training). 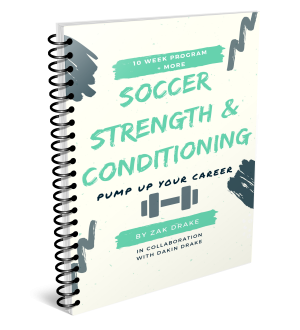 10 weeks (and more) of a gym workout periodization program to develop your soccer strength and conditioning. Over 20 pages of drills, information, tips, and workouts that are heavily influenced by my personal training throughout my playing career as well as influence from my professional team strength and conditioning development. Simple 2-day per week formula to provide complimentary work in addition to your team training sessions. 24/7 social media and email support from Zak Drake. Full Exercise Guide to explain each exercise​. *This program is an Ebook. There is no physical copy shipped to you. *The program will be sent to your email address via a downloadable link immediately after purchase is verified. It can then be downloaded to your computer, smartphone, or tablet!